I woke up to plenty of well wishes and one very sad bit of news on my birthday. 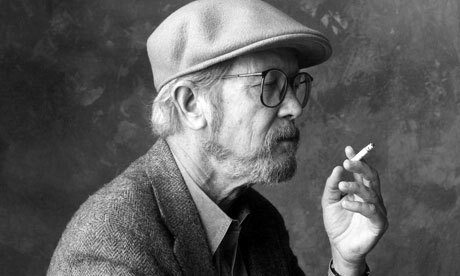 Elmore Leonard, celebrated crime author, has died. He wasn’t a young man at 87, but he was so prolific you felt like he might just keep writing forever, churning out great books filled with sizzling dialogue and even sharper characters. The man just plain knew how to write. I was reading Leonard’s “Tishomingo Blues” when I moved out to Los Angeles in August of 2003. My dad and I split the driving that trip, and when I wasn’t at the wheel I was devouring the story of a high diver, a murder at a casino, Civil War reenacters and gangsters (at least that’s how I remember it). Don Cheadle was supposed to make his directorial debut on the film adaptation, also playing a fast talking gangster with Matthew McConaughey as the lead, but financing never came together and the project fell apart. But I loved the book anyway, and it marked my first true foray into Leonard’s writing. By that time I was familiar with Leonard from his many Hollywood forays, starting (for me) with “Get Shorty,” and then “Jackie Brown” and “Out of Sight.” The latter remains one of my all-time favorite movies, a perfect blend of writing, acting, editing and direction. So much fun to watch, and hits so many notes. It’s a Hollywood movie in the way that so many aren’t. As of today, I’ve read just a few other Leonard novels, but his influence on me has only grown. “Justified” remains one of the three best shows I watch on TV (and, short disclaimer, after a DVR glitch mid-way through the second episode of Season 4, I have yet to watch this last season, but I have it all here waiting for me). Even though showrunner Graham Yost and his staff made some changes to Raylan Givens and the original “Fire in the Hole” short the series is based on, it remains a perfectly Leonard-ian show and the characters introduced would be at home in any of Leonard’s other works. I’m not a historian, and I didn’t know the man, so I won’t belabor the point any further. Elmore Leonard was a damn fine writer, and his loss is a big one. But he leaves behind an impressive legacy and a stellar body of work. There’s a lot to live up to for all of his fans pursuing creative endeavors, and we all need to try a little harder now knowing that he won’t be there to pick up the slack. This entry was tagged elmore leonard, justified, tishomingo blues, writing. Bookmark the permalink.